This year’s conference of the International Initiative for the Promotion of Political Economy (IIPPE) in Pula, Croatia had the theme of The State of Capitalism and the State of Political Economy. Most submissions concentrated on the first theme although the plenary presentations aimed at both. I was struck by the number of papers (IIPPE 2018 – Abstracts) on the situation in Brazil, China and Turkey – a sign of the times – but also by the relative youth of the attendees, particularly from Asia and the ‘global south’. The familiar faces of the ‘baby boomer’ generation of Marxist and heterodox economists (my own demographic) were less in evidence. Obviously I could not attend all simultaneous sessions so I concentrated on the macroeconomics of advanced capitalist economies. Actually my own session was among the first of the conference. Under the title of The limits to economic policy management in the era of financialisation, I presented a paper on The limits of fiscal policy (my PP presentation is here (The limits to fiscal policy). I argued that, during the Great Depression of the 1930s, Keynes had recognised that monetary policy would not work in getting depressed economies out of a slump, whether monetary policy was ‘conventional’ (changing the interest rate for borrowing) or ‘unconventional’ (central banks buying financial assets by ‘printing’ money). In the end, Keynes opted for fiscal stimulus as the only way for governments to get the capitalist economy going. In the current Long Depression, now ten years old, both conventional (zero interest rates)and unconventional (quantitative easing) monetary policy has again proved to be ineffective. Monetary easing had instead only restored bank liquidity (saved the banks) and fuelled a stock and bond market bonanza. The ‘real’ or productive economy had languished with low real GDP growth, investment and wage incomes. Maria Ivanova of Goldsmiths University of London also presented in my session (Ivanova_Quantitative Easing_IJPE_forthcoming) and she showed clearly that both conventional and unconventional monetary policies adopted by the US Fed had done little to help growth or investment and had only led to a new boom in financial assets and a sharp rise in corporate debt, now likely to be the weak link in the circulation of capital in the next slump. Keynesian-style fiscal stimulus was hardly tried in the last ten years (instead ‘austerity’ in government spending and budgets was generally the order of the day). Keynesians thus continue to claim that fiscal spending could have turned things around. Indeed, Paul Krugman argued just that in the New York Times as the IIPPE conference took place. 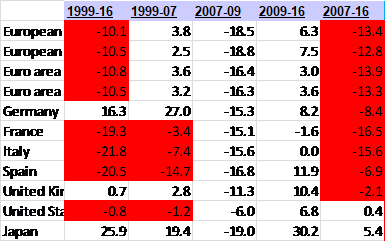 But in my paper, I refer to Krugman’s evidence for this and show that in the past government spending and/or running budget deficits have had little effect in boosting growth or investment. That’s because, under a capitalist economy, where 80-90% of all productive investment is by private corporations producing for profit, it is the level of profitability of capital that is the decisive factor for growth, not government spending boosting ‘aggregate demand’. In the last ten years since the Great Recession, while profits have risen for some large corporations, average profitability on capital employed has remained low and below pre-crash levels (see profitability table below based on AMECO data). 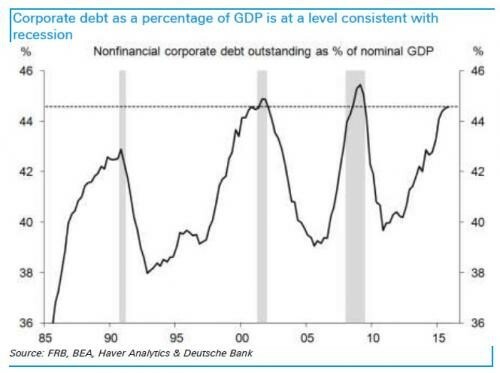 At the same time, corporate debt has jumped up as large corporations borrow at near zero rates to buy their own share (to boost prices) and/or increased payouts to shareholders. Government spending on welfare benefits and public services along with tax cuts to boost ‘consumer demand’ is what most modern Keynesians assume is the right policy. But it would not solve the problem (and Keynes thought so too in the 1940s). Indeed, what is required is a massive shift to the ‘socialisation of investment’, to use Keynes’ term, i.e. the government should resume responsibility for the bulk of investment and its direction. During the 1940s, Keynes actually advocated that up to 75% of all investment in an economy should be state investment, reducing the role of the capitalist sector to the minimum (see Kregel, J. A. (1985), “Budget Deficits, Stabilization Policy and Liquidity Preference: Keynes’s Post-War Policy Proposals”, in F. Vicarelli (ed. ), Keynes’s Relevance Today, London, Macmillan, pp. 28-50). Of course, such a policy has only happened in a war economy. It would be quickly opposed and was dropped in ‘peace time’. That’s because it would threaten the very existence of capitalist accumulation, as Michal Kalecki pointed out in his 1943 paper. Now in 2018, the UK Labour Party wants to set up a ‘Keynesian-style’ National Investment Bank which would invest in infrastructure etc, alongside the big five UK banks which will continue to conduct ‘business as usual ‘ i.e. mortgages and financial speculation. Under these Labour proposals, government investment (even if implemented in full) would rise to only 3.5% of GDP, less than 20% of total investment in the economy – hardly ‘socialisation’ a la Keynes at his most radical.. But perhaps President Trump’s version of Keynesian fiscal stimulus (huge tax cuts for the rich and corporations , driving up the budget deficit) will do the trick. It is an irony that it is Trump that has adopted Keynesian policy. He certainly thinks it is working – with the US economy growing at a 4% annual rate right now and official unemployment rates at near record lows. But an excellent presentation by Trevor Evans of the Berlin School of Economics poured cold water on that optimism. With a barrage of data, he showed that corporate profits are actually stagnating, corporate debt is rising and wage incomes are flat, all alongside highly inflated stock and bond markets. The Trump boom is likely to fizzle out and turn into its opposite. Also, Arturo Guillen of the Metropolitan University of Mexico City,( IIPPE 2018 inglés) reminded us that the medium term trajectory of US economic growth was very weak with productivity growth very low and productive investment crawling. In that sense, the US was suffering from ‘secular stagnation’, but not for the reasons cited by Keynesians like Larry Summers (lack of demand) or by neoclassical critiques like Robert Gordon (ineffective innovation) but because of the low profitability for capital. There were also some sessions on Marxist economic theory at IIPPE, including a view on why Marx sent so much time on learning differential calculus (Andrea Ricci) and on why Marx’s transformation of value into prices of production is dialectical in its solution (Cecilia Escobar). Also Paul Zarembka from the University of Buffalo, US presented a paper arguing that the organic composition of capital in the US did not rise in the post-war period and so cannot be the cause of any fall in the rate of profit. His concepts and evidence do not hold water in my view. Zarembka argues that there is a major problem concerns using variable capital v in the denominator in the commonly-expressed organic composition of capital, C/v. That is because v can change without any change in the technical composition. Using, instead, what he calls the ‘materialized composition of capital’, C/(v+s), movement in C/v can be separated between the technical factor and the distributional factor since C/v = (1 + s/v). With this approach, Zarembka reckons, using US data, he can show no rise in the organic composition of capital in the US and no connection between Marx’s basic category for laws of motion under capitalism and the rate of profitability. But I think his category C/(v+s) conflates the Marx’s view of the basic ‘tendency’ (c/v) in capital accumulation with the lesser ‘counter-tendency’ (s/v) and thus confuses the causal process. This makes Marx’s law of profitability ‘indeterminate’ in the same way that Sweezy and Heinrich etc claim. As for the empirical consequences of rejecting Zarembka’s argument, I refer you to an excellent paper by Lefteris Tsoulfidis. As I said previously, there were a host of sessions on Brazil, Southern Africa and China, most of which I was unable to attend. On China, what I did seem to notice was that nearly all presenters accepted that China was ‘capitalist’ in just the same way as the US or at least as Japan or Korea, if less advanced. And yet they all recognised that the state played a massive role in the economy compared to others – so is there a difference between state capitalism and capitalism? I cannot say anything about the papers on Brazil except for you to look at IIPPE 2018 – Abstracts. Brazil has an election within a month and I shall cover that then – and these are my past posts on Brazil. There were other interesting papers on automation and AI (Martin Upchurch) and on bitcoin and a cashless economy (Philip Mader), as well as on the big issue of imperialism and dependency theory (which is back in mode). The main plenary on the state of capitalism was addressed by Fiona Tregena from the University of Johannesburg. Her primary area of research is on structural change, with a particular focus on deindustrialisation. Prof Tregena has promoted the concept of premature deindustrialisation. Premature deindustrialisation can be defined as deindustrialisation that begins at a lower level of GDP per capita and/or at a lower level of manufacturing as a share of total employment and GDP, than is typically the case internationally. Many of the cases of premature deindustrialisation are in sub‐Saharan Africa, in some instances taking the form of ‘pre‐industrialisation deindustrialisation’. She has argued that premature deindustrialisation is likely to have especially negative effects on growth. As for the state of political economy, Andrew Brown of Leeds University has explained some of the failures of mainstream economics, particularly marginal utility theory. Marginal utility theory has not to this day been developed in a concrete and realistic direction not because it is just vulgar apologetics for capitalism, but because it is theoretically nonsense. Marginal utility theory can provide no comprehension of the macroeconomic aggregates that drive the reproduction and development of the economic system. ‘Financialisation’ is the word/concept that dominates IIPPE conferences. It is a concept that has some value when it describes the change in the structure of the financial sector from pure banks to a range of non-deposit financial institutions and the financial activities of non-financial corporations in the last 40 years. But I am not happy with the concept when it used to suggest that the financial crash and the Great Recession were the result of some new ‘stage’ in capitalism. From this, it is argued that crises now occur not because of the fall in productive sectors but because of the speculative role of ‘’financialisation.’ Such an approach , in my view, is not only wrong theoretically but does not fit the facts as well as Marx’s laws of motion: the law of value, the law of accumulation and the law of profitability. For me, financialisation is not a new stage in capitalism that forces us to reject Marx’s laws of motion in Capital and neoliberal economics is not in some way the new economics of financialisation and a different theory of crises from Marx’s. Finance does not drive capitalism, profit does. Finance does not create new value or surplus value but instead finds new ways to circulate and distribute it. The kernel of crises thus remains with the production of value. Neoliberalism is merely a word invented to describe the last 40 years or so of policies designed to restore the profitability of capital that fell to new lows in the 1970s. It is not the economics of a new stage in capitalism. Sure, each crisis has its own particular features and the Great Recession had that with its ‘shadow banking’, special investment vehicles, credit derivatives and the rest. But the underlying cause remained the profit nature of the production system. If financialisation means the finance sector has divorced itself from the wider capitalist system, in my view, that is clearly wrong. This entry was posted on September 14, 2018 at 7:56 pm and is filed under capitalism, economics, marxism, Profitability. You can follow any responses to this entry through the RSS 2.0 feed. You can leave a response, or trackback from your own site. Hi Robert can you give a link for “There were other interesting papers on automation and AI (Martin Upchurch)”? I do NOT write that the “organic” composition of capital is flat, but rather the “materialized” composition of capital C/(v+s) is basically flat since 1956 in the U.S. productive sectors. It is not dissimilar in magnitude from the level of 1.77 Engels calculated on behalf of Marx for cotton spinning. There is also a typo in the comment insofar as C/v does not, in any case, equal (1 + s/v). Rosa Luxemburg had realized that (v+s) belongs in the denominator of the composition of capital but still thought it rising. She seems incorrect on this empirical question for the U.S. productive sectors. Paul Thanks for the comment and correction. We can consider the empirical outcomes for the US and elsewhere further. Even if it was the case, that wouldn’t invalidate Marx’s tendency of the profit rate to fall theory, as capitalism is a worldwide system, and this theory is only absolute for capitalism as a whole, not (necessarily) just one Nation-State (which is only the basic administrative unit of real existing capitalism). But I agree the USA never fully embraced “Toyotism” (people usually buy this myth because of the Silicon Valley phenomenon) — at least in terms of robots per workers ratio. In fact, true “Toyotism” only happened in two countries: Japan (country of origin) and South Korea (Japan’s carbon copy). The problem with “Toyotism” is that it is very good when we’re talking about intercapitalist competition (i.e. struggle for market share): you give up some profit rate in order to conquer terrain in the market; that’s why it worked in Japan when the USA reigned supreme during the post-war period, but exausted after it begun to carve up the American market. The path chosen by the USA was “financialisation”, i.e. consumer economy, rested on the dollar standard (consolidated with the Petro Dollar creation in 1971 and the Plaza Accord in 1985). Marx’s volume III statements about the profit rate were completed around 1864-5 and never reconsidered directly. Volume I in the first two German editions had only two types of compositions of capital but by the time Marx edited in 1875 compositions of capital for the French edition he formulated three different types. This is important as it shows evolving thought and I submit the “materialized” composition best reflects what he was working toward. Further a couple of 1989 articles I cite argue that the evolution was even deeper than this. I think the “materialized” composition offers the clearest way forward to understanding any trend since distributional questions are abstracted out when C/(v+s) is the focus in reference to technology. C/v conflates the two when discussing profit rate tendencies. Paul – I dont agree with what you say. But it is difficult to make all my points in a short comment section. So i am going to send you a short doc by email to you. We can continue the debate, if you like, there. “the [Chinese] state plays a massive role in the economy compared to others – so is there a difference between state capitalism and capitalism?” The obvious difference is that the new Chinese capitalist class – residing in both the state and private sectors – transformed a socialist economy into a capitalist one. The ruling capitalists have orchestrated one change after another for 40 years, with more to come. This method has worked much better for them than the Gorbacheve-Yeltsin shock treatment did in the former Soviet Union. By now, the facts show that the Chinese economy develops by capital accumulation for profit, not by an all-round plan of all investment. I disagree with you. China is a socialist country, if by socialism you mean any kind of transition between capitalism and communism. Yes, there is capital in China (therefore, also profit), but it isn’t the dominant form of social reproduction: communal property is (still) the dominant one. “all-round plan of all investment” is a feature of communism. Socialism is a transition system. In China, the most strategic sectors are still State-owned. You can observe this by simply seeing the results: wages are rising fast in real terms, life quality of the Chinese people is improving at an observable rate. Today, China’s per capita earnings are double of Brazil’s — even the “cheap labor force” mantra is not true anymore. Value production, reproduction of the labour force and surplus value creation and appropriation, with market realization of the profits, these are the criterion of capitalism. Whether the state or private capitalists own the means of production – as long as the goal is to produce capitalistically – is of importance only insofar as it changes the dominating factors. And China certainly produces for a market, the world at large. Agreed, Chinese capitalism is more organized and takes a longer view of the situation and also has more transparent equalization of profit rates (support to some industries, taking from others) than the western version. There is definitely an element of state capitalism in China but with more surreptitious appropriation by the new capitalist class as Charles A. says, Chinese living in the same world as western investors into their country. Does China produce ”çapitalistically” as a goal? Is profit the main driver of investment and production in China or is the preservation of the regime? Is the aim of the Chinese Communist one-party autocratic state to exploit the workforce and people for the market realisation of profits and for a class of capitalists? I am not convinced that it is the modus operandi. If it is just capitalist why has it (mostly) avoided the global crisis even as just one state? These are questions to debate in my view and not yet decided. I was there for part of the second day. And I did change sessions midstream when I could. But I did leave early, unfortunately, for personal reasons. “Does China produce ‘capitalistically’ as a goal?” The goal has been explicit: go to a market economy. See The Unlikely Partners by Gevirtz. “Is profit the main driver of investment and production in China or is the preservation of the regime?” The economic and the political go hand in hand; no either-or choice here..
“Is the aim of the Chinese Communist one-party autocratic state to exploit the workforce and people for the market realisation of profits and for a class of capitalists?” The state officials are often capitalists, directly and through their family, and they have a multitude of connections with the private capitalists, too – bribes both specific and in a general sense. And as you know, profits come from surplus value. “If it is just capitalist why has it (mostly) avoided the global crisis even as just one state?” Gee, the same question that is discussed in connection with the Hitler regime in the 1930s. There are some interesting and unsettling parallels between the historical situation of global capitalism in the 1930’s and today: the deepening crisis in the world capitalist system, an imperialist co-opted social democratic elite and a defeated revolutionary socialist cadre in the mature, competing, imperialist capitalist states, the rise of a new, competing “capitalist” power–China (one might include Russia) but–like the established powers–with no room to grow. The parallels are eerie. Charles implies an analogy with Nazi Germany: China? capitalist or socialist? Nazism was the product of a failed revolution, state capitalist China, is the product of a successful peasant revolution, with still a vast state owned infrastructure, including the land. So the analogy is only an analogy. The Chinese leadership (which is far from fascistic) is are well aware of history. Samir Amin, who expected a confrontation between Chinese “capitalism” and the West (which cannot allow China [or Russia] to develop fully), projected an eventual hard choice for China between de-linking from the West and renewed development of its socialist infrastructure, or falling into a “lumpen” comprador state–not initiating a new imperial war like Nazi Germany (same for Russia, etc.). Such a war will be fomented by the encircling imperial hegemonic power, the US. And must be guarded against. There is great uncertainty and the distinct possibility of war, but one thing is certain. We live in world that is vastly different from that of the 1930’s . The question isn’t if China is, by itself, a capitalist country, but whether or not China is part of the network of capitalist accumulation on the international stage. Indeed it is. As for (mostly) avoiding the global crisis, other countries have (mostly) done that– Germany, Switzerland, Bolivia, etc. Does that make them (mostly) non-capitalist? Your definition of capitalism is objectivelly wrong. What you defined is “capital”. “Capitalism” is the system where “capital” is the DOMINANT form of social reproduction. By your definition, Ancient Egypt and Ancient Rome were also capitalist, since pockets of capital already existed then (production of rope and mines, respectivelly). Yes, there is “capital” in China, but it (still) isn’t the dominant form of social reproduction. The article you mention by Lefteris Tsoulfidis was published last year as “Growth Accounting of the Value Composition of Capital and the Rate of Profit in the U.S. Economy: A Note Stimulated by Zarembka’s Findings”, Review of Radical Political Economy, Vol. 49(2), pp. 303-312. That article reports calculations of the materialized composition of capital C/(v+s) that do not materially differ from my own, at least for comparable time periods. In my earlier article, I had reported stability since 1956 for the United States. Lefteris, however, finds that the organic composition C/v rises. That is due to rising s/v, as C/v = (1 + s/v) ∙ C/(v+ s). Thanks for our off-blog discussion that has been taking place on our differing theoretical concerns.